United have a good record in the capital this season including two wins and a draw, but would they lose their heads at the Boleyn Ground or could they escape to the North with another valuable three points? After confirming their place in the 5th round of the FA Cup in midweek with a comfortable win over Cambridge, it was back to the Premier League and a must win match over West Ham. 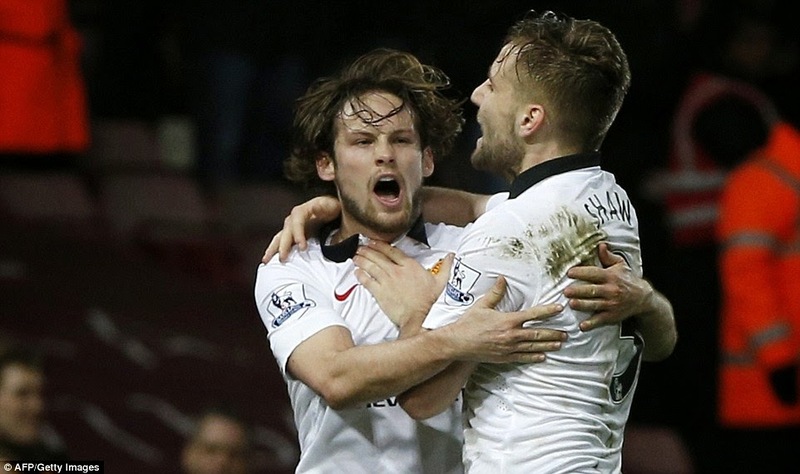 Three points gained would put United within one win of local rivals Man City, so the incentive to win was huge. 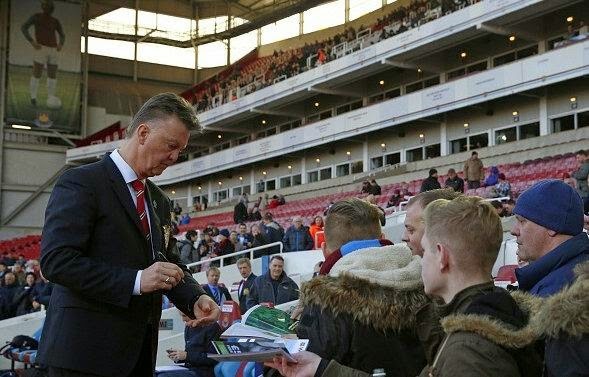 How would van Gaal utilise his squad bearing in mind they have another match coming up on Wednesday? Here was the answer. Man United: De Gea, Valencia, Jones, Rojo, Shaw, Blind, Rooney, Januzaj, Di Maria, Falcao and van Persie. No starting place for Herrera as once again Louis van Gaal gave another chance to Januzaj. The Subs were: Valdes, Mata, Smalling, Herrera, Fellaini, McNair and Wilson. The match was a milestone for two players. Robin van Persie was making his 100th appearance for the club and Adnan Januzaj his 50th. At the beginning of the first half, both sides started positively but both made early mistakes. Robin van Persie was almost put through in the box by a rash back pass which the Dutchman just couldn’t react to in time. Then at the other end de Gea made a rare error by under hitting a clearance which Jones cleared up, strange as it’s usually the other way around with those two. West Ham pressed forward in the first 10 minutes without really creating a clear chance as United held firm at the back with the help from the likes of Di Maria and Rooney backing up from midfield. 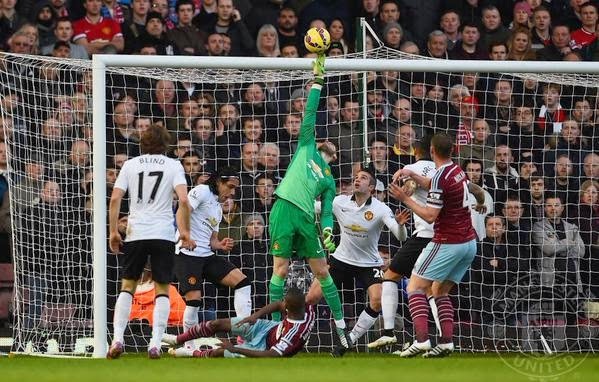 David de Gea redeemed himself for his earlier mistake with two fine stops from Enner Valencia. The first from a long range effort that he turned away around for a corner at full stretch, that was followed by a superb reaction tip over from close range. At this point, the home side was in the ascendancy. United had to get a grip on the match or they could find themselves in trouble. When United did attack unfortunately the last ball into the danger area was poor as has been the story of the season so far. A series of poor deliveries, especially from corners, didn’t help the cause. It was good to see the commitment shown by Di Maria as he ran back at full pace to help out Antonio Valencia to thwart a West Ham counter attack. I just wish he was using his speed at the other end to the same effect. Van Persie was fortunate, not to receive a yellow card on the half hour after his elbow connected with a defenders cheek. I’ve seen cautions given for a lot less. De Gea’s third save in the match came from a header at the far post, which he cleared with his size 10’s. The pressure was mounting on United as the home support were getting behind their team and calling for every decision to be given their way. United needed to get control of the ball and stamp their authority on the match. Januzaj wasn’t getting involved in the game and you got the feeling that the match would have suited Fellaini’s style of play more. Rooney wasn’t enjoying himself in the middle of the park and was slowly losing his temper with some of the referee’s decisions as the game was slipping from United’s grasp. 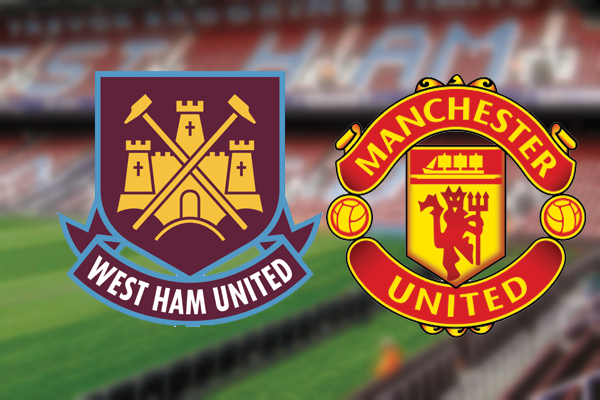 Rojo received United’s first yellow card for a professional foul as West Ham broke forward. Di Maria had an effort from distance saved by the keeper and that really was the visitors only effort on goal in 40 minutes. United ended the half with a flurry of corners which amounted to nothing of worth due to poor service. Thanks to David de Gea the score was 0-0 at half-time with United not producing anything near their capabilities. Something had to change in the second half. The main worry was the partnership of Falcao and van Persie which had no teeth and was drawing blanks. A lot of huffing and puffing but with no incisive play. The second half started poorly for United as they allowed the home side to get at them from the start, which paid dividends in the 48th minute with a goal of great close skill in the penalty area from Kouyate as he juggled the ball, span and shot past de Gea in a crowded penalty area. Would United react positively? They did through Valencia who broke down the right and provided a cross which eventually struck a defenders arm in the area. However, referee Clattenburg was having none of it. United upped their game as they had to. Falcoa tried his luck from distance but pulled his shot wide, Van Persie was flagged offside as he attempted to convert a through ball and Falcao almost got his head onto a Luke Shaw cross. Game on! Shaw was involved in an ugly collision with goal scorer Kouyate in the opposition box as he tried to get on the end of a one-two with Januzaj. Luckily Shaw got up and ran off the knock. United had a lucky let-off as an effort from West Ham somehow squirmed agonisingly past the post with Valencia and de Gea hopelessly looking on from the touchline. 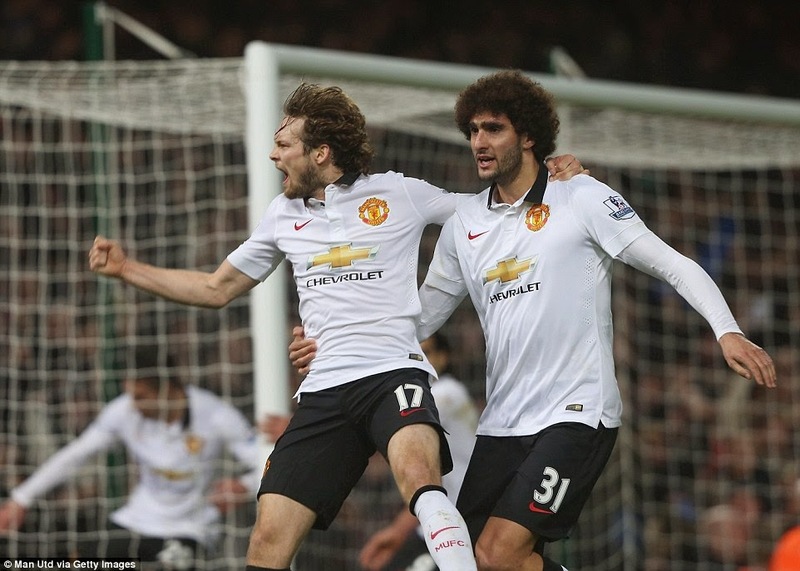 A change had to be made and eventually van Gaal made it in the 71st minute by bringing on Fellaini for Januzaj. Could Fellaini continue his habit of scoring as a substitute? His presence was felt almost from his entrance as his height advantage was working in United’s favour. Clattenburg awarded a free-kick to United for a foul on Rooney which was taken by Di Maria from distance and sailed high over the bar. This is exactly where United is struggling, dead ball situations, an area they have to improve on. In the 76th minute, Falcao was played through on goal by a delightful van Persie flick but he prodded his shot wide as the keeper closed him down. That was United’s best chance by far and in reality Falcao should have done a lot better. Home keeper Adrian saved with his feet from a van Persie effort when, as with Falcao the Dutchman should have done better in a goalscoring position. This was immediately followed by a caution for Luke Shaw as he stopped a break from the home side. As the match entered the last five minutes de Gea once again came to the rescue. Then at the other end Fellaini came so close to grabbing the equaliser but Adrian managed to get a hand to it down at the near post. Van Persie went down questionable on the edge of the box to earn United a free kick which Rooney fired straight into the wall. As the ball was put back in by Rojo it eventually came out to Blind who fired home with aplomb. A great finish by the Dutch midfielder similar to his goal at West Bromwich earlier in the season. The downside to the excitement of earning a point was a second yellow and subsequent red for Shaw for a high challenge at the death. He will now miss the Burnley match on Wednesday. Until his dismissal, he had been United’s man of the match. The match ended 1-1 and a point shared for both sides, but you felt that Man United were the happier of the two teams. Poor performances from too many players contributed in today’s result, none more so than Januzaj and Falcao. Big Sam Allardyce’s team is difficult to beat this season but United should have done a lot better in their approach to the match. The home side will be very disappointed to concede the late equaliser and will surely feel they let the Red Devils off the hook. A big concern is the partnership up front of Falcao and van Persie, which in all honesty hasn’t worked all season. I would be interested to know how different past results would have been if Rooney had been in his striker position with the Colombian or Dutchman as a partner. At the start of the season, my mouth was watering at the prospect of a forward line which included Rooney, van Persie, Falcao and Di Maria. 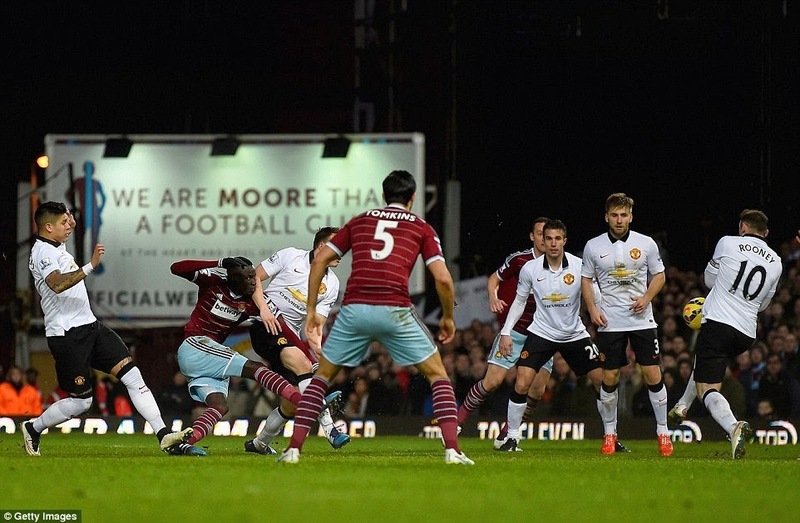 They didn’t seem to be any urgency in United’s play until West Ham scored and Felliani came on to the pitch. With Man City dropping points, we had a chance to close the gap on second place but didn’t take it. Sure we didn’t lose but we are United and over the years have always turned the screw after the New Year that is just not happening. I will say it again Rooney’s goalscoring talents are wasted in midfield and how van Gaal can not see that only he knows. Rooney is not a playmaker in the mould of Scholes and never will be. Slightly worrying is the statistic that United haven’t won a game in which they have conceded first in the Louis van Gaal era and they haven’t won any away game in which they conceded first since December 2013. Next up is the visit to Old Trafford of Burnley this coming Wednesday and a chance for United to pick up a valuable three points before the break for the FA Cup clash away at Preston. Previous Man United replay joy.